Tips for Nashville Deck Cleaning from PRO WASH,LLC. During the warmer months, an outdoor deck or patio can become the most used part of a home. A deck can be a great entertaining space for friends and family or a place of solitude to read a book on spring Sunday morning. Regardless of the intended use, a deck still has maintenance needs. If properly cared for, a wood deck can provide many, many years of service, and look good doing it. When your wood deck has lost its luster, pressure washing can restore the natural beauty. You will want to use the LEAST amount of pressure possible to achieve the best results. Wood is a soft material and becomes even softer when saturated with water. Carelessly blasting a deck with a pressure washer is a sure fire way to leave scars and rough edges all over otherwise beautiful wood. With some patience and the proper chemicals and equipment, it is possible to bring your deck back to life. Here are a few helpful tips for pressure washing your wood deck. Start off by using the widest fan pattern nozzle you have. The wider the spray pattern, the less the water impacts the surface. Pressure wash one board at a time, end to end, moving at a slow and steady pace. This prevents unsightly marks on the wood. Make sure your pressure washer and hoses are set up so that you can move fluidly down each deck board, if you have to stop in the middle because you ran out of hose you will likely see a line where you stopped and started again. Keep it slow, steady and uniform. Lines WILL develop in the deck boards if the pace of pressure washing is erratic. Try not to skip around, the name of the game is UNIFORMITY. Remember, if the wood starts to splinter or look fuzzy, you are using too much pressure! 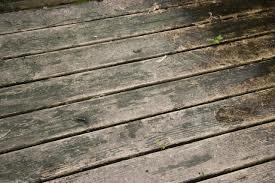 If the results are not as clean as you want, consider using the proper chemical for the type of stains on your deck. After the deck boards are finished, move on to the railings/stairs. All of the same principles apply. WHAT ABOUT DECK CLEANING CHEMICALS? Chemicals are used so that water pressure can be kept to a minimum. The use of chemicals on wood completely depends on what you are trying to clean off of it. Typically it is mold and mildew, or maybe tree sap that has caused most of the stains. A mixture of soap and water can be brushed onto the wood prior to pressure washing, or if the deck is heavily covered with mildew, a solution of bleach and water may be needed. Grease, oil, and food & beverage stains may need to be pre-treated with a de-greasing agent prior pressure washing. Water alone usually will not remove these types of stains. If there is a colored stain or sealer you are trying to remove, you will need to apply a stripping chemical to the wood, followed by neutralizer, then power wash the deck. No two decks are exactly the same. Sunlight conditions, materials, and foot traffic are just a few of the factors that determine how often a deck should be cleaned. PRO WASH, LLC recommends annual cleanings. As with most building materials, maintaining a clean surface is far more efficient than bringing a heavily soiled one back to original condition. Use a spray nozzle with a larger orifice than your pressure washer is rated for. The increase in flow means a reduction in pressure. Use a Nozzle Chart to find the correct nozzle. A deck is a large investment and can add luxury and value to a home. Proper care and maintenance are essential to its appearance and lifespan. If you need additional resources for deck cleaning or any other pressure washing project, please visit our website at www.prowashnashville.com or give us a call at 615-999-0104. This maintenance video is from one of the largest suppliers of deck materials in the country. Aside from annual cleanings, it is also a good idea to perform an annual inspection of the deck.